And here we are with my final post of burgers in San Francisco! Just kidding, you know I'll probably have more since new places that make 'em continue to pop-up here and there. Seriously, there is a whole world of bar burgers out there I haven't really tried. The whole not really being a bar hanger outer kind of person makes it a challenge, Hi Tops notwithstanding, which was a special occasion thingy. Beyond all that, there are still a handful of juicy, meaty burgers I wanted to highlight, including one which was da' bomb y'all! It's 3am, the bars have closed and you are super hungry, where you gonna go? In SF, you choices are limited as this isn't a big really late night eat town, which is kind of surprising considering the number of bars we have in town. But there are a handful of places you can find like Pinecrest Diner. A stalwart in town that is open 24 hours serving up classic old school diner food from breakfast through dinner including a cooked to order burger anyway you want it. Bonus, those thin cut sweet potato fries all crispy, salty and proliferous. It will soak up all the alcohol for you. Here is a messy one for you and it is in a messy part of town at 6th and Market, a challenging hood. Still, Homeskillet gets a steady lunch force crowd and the burgers are big and crammed full of those vegetable toppings. The bun didn't hold up all too well but it tasted quite good. The sweet potato fries were a hair on the over cooked side for me, but not enough I didn't eat all of them. Probably not a place to take your parents when they visit, though you office co-workers might enjoy the street theater you will get with their burger from all the windows. cheeseburger and fries from Belcampo Meat Co. Here I was getting fancy with my burger choices when I popped into Belcampo Meat Co. one day to see they had. You'd expect a burger at a butchery specializing in meat to be good and it was quite a juicy bite of ground meat. It came complete with their own version of special sauce not to mention a side of fries and some pickled veggies for $13. At the time I though it was a deal and probably still would be, but seems the cost is now $15 for the burger and I don't know if it still comes with sides. I would hope so as that is a lot for just a burger, even for SF. Here is a left field one, Mission Beach Cafe has a darn good burger and you don't need to wait in that excruciating brunch line to try it. They do serve dinner and it doesn't draw the crowds which is a shame since the food is superb here right down to the house made desserts. 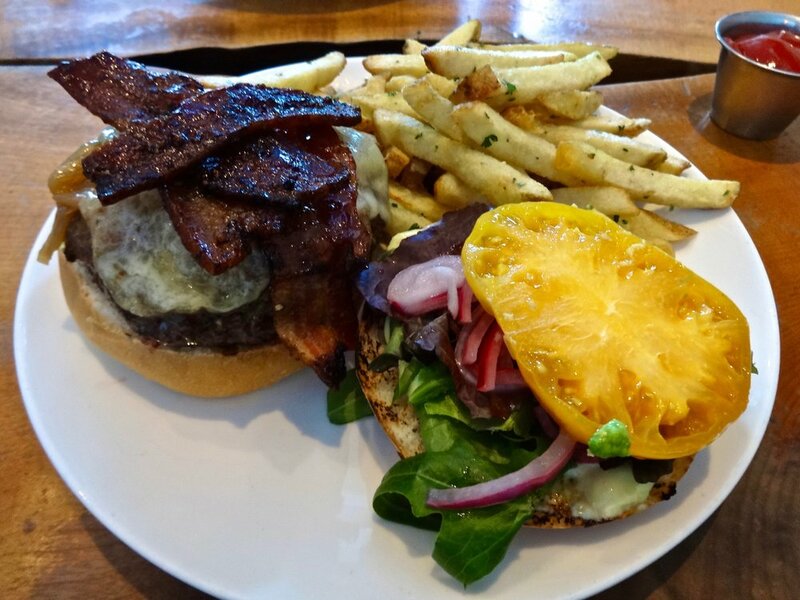 The burger is big and loaded with veggies including sliced heirloom tomato. The bacon was thick and crispy too. A real winner from bite to bite. Here is one I really only add so I can say a fond farewell to. Sadly, Big Chef Tom packed up and moved back to Pennsylvania where he will be opening a place in Philadelphia. While for some people his Belly Burgers were hit or miss, I really liked them. They were all ground pork belly burgers and super juicy. The All-American above came with green apples, American cheese and mayo which seems like an odd combo but on ground pork burger, worked to perfection. I'll miss you Chef Tom along with your pork belly and onion strings. From the people that brought you Causwell's in the Marina (I looked past that!) comes Popson's Burgers. They had a bried pop-up down near Caltrain before taking over their current Market St. locale. I made a habit of stopping in since it was so close and I miss it as the chili cheese burger was just to die for. Juicy meat covered in no beans! chili, diced onions and a smooth and creamy nacho cheese like sauce. It is the ultimate in bad for you don't even think about being on a diet burgers. It's meat on meat with nacho cheese people, how can you go wrong?! Well, it could, but they didn't and I could just bath in the delight of it. It is truly sloppy joe meets burger then goes for a swim in cheese. Throw in their version of special sauce (too) and just---YUM! And no, don't even think about trying to pick this up, go straight for the fork or spoon and dig in. Okay then, the great burger parade has ended, but I'm sure I will come across more and will continue to highlight them individually as I do. Much like the ubiquitous fried chicken sandwich in this town, a new burger is always on the horizon somewhere. And while these may not be on many peoples best of list, I certainly enjoyed them. The trick is to just keep trying as many as you can until you find ones you like. And if the price includes a side of fries, it makes them even better.